Run Kerala Run Marathon event 2015 will held on January 20,2015 at 700 points spread in different parts of Kerala state with participation of public. The Run Kerala Run Marathon event intention to promote 35 th National Games Kerala and strengthen unity. The live telecast of marathon event will be available on DD Malayalam, DD Sports, all leading Malayalam news channels and streaming on websites. Go through below article for more details of live Run Kerala Run and participation of Sachin Tendulkar. The 35 th National Games Kerala scheduled to held from January 31 – February 14, 2015 in venues spread different parts of Kerala state. In order to gain public support, popularize the National Games and strengthen unity the Kerala government and National Games organizing committee has been conducting Run Kerala Run Marathon event with the participation of public in huge numbers. The Run Kerala Run Marathon scheduled for January 20, 2015 at 10:30 a.m IST will be flagged off by honorable governor of Kerala P Sathasivam along with Sachin Tendulkar, the goodwill ambassador of 35 th National Games Kerala at Secretariat in Thiruvananthapuram. The Run Kerala Run marathon a 500 meters distance mass run will be run in different cities, villages across Kerala by approximately 10 million public of all ages, sexes, groups, employees, sportsmen, movie stars etc at around 700 points. Those enthusiasts enough to watch the live Run Kerala Run 2015 marathon on TV channels and online streaming can get the details from below. The below given official broadcasting partners of 35 th national games 2015 Kerala will telecast the live Run Kerala Run Marathon held on January 20, 2015. Along with official broadcasting partner channels, all Kerala's leading news channels Asianet news, Mathrubhumi News, Reporter TV, Kairali TV, Amrita TV etc will live telecast the Run Kerala Run marathon event. Those having PC, Laptop, Tablet and Smartphone can watch the online live streaming of Run Kerala Run Marathon through the below given website links. The major highlights of Run Kerala Run Marathon are the participation of Kerala's goodwill ambassador of sports, the 35 th National Games and God of cricketer Sachin Tendulkar. Along with Tendulkar another highlights of the Run Kerala Run marathon is the participation of 95 years old retired teacher, Chellema. Reports are stating that the grand mass gathering event Run Kerala Run may enter into the Guinness Book of World Records. 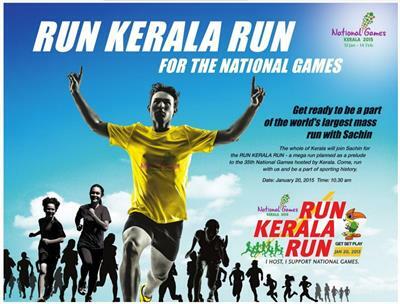 The Kerala State government has granted special permission to employees for participating in Run Kerala Run on January 20, 2015 from 10:30 a.m - 11:30 a.m. People of Kerala are keen to make the event a super success. For More updates and latest news and information related to the Run Kerala Run marathon event one can visit the official website of the event http://www.runkeralarun.com or follow the Facebook page http://www.facebook.com/runkeralarun.